Google launched Google Takeout in June 2011 to recover data that you host at Google, and continuously added support for more services to the tool. Originally, the focus was on Gmail, contacts and Google+ and circles, your Picasa photos, and your profile. It was already possible to download data from Google Takeout to your computer including Google Drive documents, Gmail, Picasa, Contacts and so on. Here Google has added YouTube to the program. 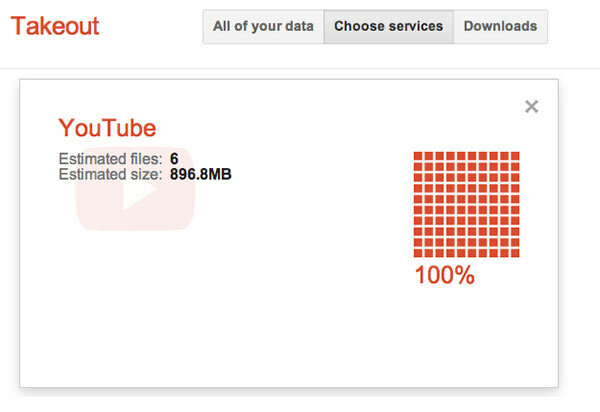 The principle is simple, once you select YouTube as an option on Google Takeout then Google prepare the compressed file that you can download on your computer. These are the original files that you have uploaded to YouTube that you will recover. 1. Visit Google Takeout and select Choose services. 2. In the list of services, select YouTube. 3. Now press Create Archive. Google will generate the compressed file (zip). Obviously, if you have dozens or hundreds of videos, creating the file could be quite long. This process will take time depending on your uploaded videos it need to download, meanwhile you can select the option “Email me when ready” so that you can get an email from Google once your download gets ready. When videos download is finished, click “Download” button. That’s it.